Germanium was discovered in 1886. 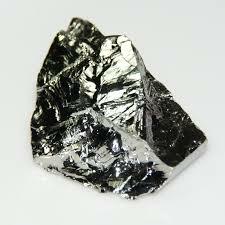 Germanium belongs to the carbon family and used in electronic devices as semiconductors. Dmitri Mendeleev predicted the existence of germanium in 1869. He named it eka-silicon and proposed some of the physical characteristics of the then unknown metal. Later, Clemens Winker discovered germanium from a rare mineral known as argyrodite, in 1886 . He successfully prepared various compounds with chlorides, fluorides, and dioxide, and found that the physical characteristics of germanium were almost the same as were predicted by Mendeleev. Germanium became a significant element in 1945, when it was used semiconductor in electronic, mostly diodes. Its symbol is Ge. In 1948, germanium transistors were developed and opened new horizons in electronic industry. In 2000, around 80% of the world’s germanium production was used in the manufacturing of optical fibers communication networks and laser infrared night vision systems. The element was named germanium by Winkler that was derived from Germania (Germany), his homeland. Germanium is an abundant element and is ranked as the 15th most abundant element in the earth’s crust. Germanium is not present in its pure elemental form and mostly extracted from its zinc ore (sphalerite) and from ores of copper, silver and lead. Extremely pure germanium crystals are obtained through a technique termed as zone refining which produces semiconductor grade germanium with an impurity of 1 in 1010. This germanium semiconductors are considered as one of the purest substance that are ever made. The largest producers of germanium in the world are China, USA and Russia. Germanium is a whitish grey lustrous metalloid (semi-metallic) . It is hard and brittle in nature. there are two allotropic forms of germanium, alpha and beta germanium. Alpha germanium is hard lustrous metal with a cubic crystal structure that resembles diamond. The beta germanium is silvery and soft metal . Pure germanium reacts slowly with air at higher temperature, around 250°C and forms germanium oxide. It does not react with dilute acids but is easily dissolved in hot concentrated acids. Germanium reacts with halogens to form compounds like germanium tetrachloride and germanium tetraiodide. Germanium reacts with oxygen and form two oxides, germanium monoxide and germanium dioxide. It also reacts with sulfur, selenide and telluride to form disulfide GeS2, germanium diselenide GeSe2 and germanium telluride (GeTe) . Germanium has been widely used for manufacturing of semiconductors. It is used to make light emitting diodes (LEDs). Germanium is used in making optical fibers and solar cells. Germanium is used to make nanowires, which is one of its most recent usages. Various organic compounds of germanium have diverse applications, such as tetraethyl germane is widely used in the study of organometallic chemistry. Germanium and most of its natural compound are non-toxic as they are insoluble in water. certain synthetic salts of germanium are toxic and have shown to have damaging effects on kidneys. Germanium is not a biologically significant element and have no role in the bodies of plants or animals. Germanium have five naturally occurring isotopes: germanium-70, germanium-72, germanium-73, germanium-74 and germanium-76. Germanium-74 is the most abundant isotope while germanium-76 is the least abundant. Germanium-76 is also radioactive, however, it is not highly radioactive as it has a half-life of 1.78 ×1021 years. There are also twenty-seven artificially prepared radioisotopes of germanium. Their mass number range from 58 to 89.
. Winkler, Clemens (1887). “Germanium, Ge, a New Nonmetal Element”. Berichte der Deutschen Chemischen Gesellschaft (in German). 19 (1): 210–211. doi:10.1002/cber.18860190156. Archived from the original on December 7, 2008.
. Emsley, John (2001). Nature’s Building Blocks. Oxford: Oxford University Press. pp. 506–510. ISBN 978-0-19-850341-5.